We all know that sewage, stormwater and wastewater cannot flow uphill without being pumped! There are many situations where sewage, stormwater and wastewater cannot drain away and must be transferred to a higher point, whether it be to a sewer main, stormwater pipe, easement etc. The packaged pumping stations are an efficient solution where traditional gravity-reliant sewage and stormwater systems are not possible or are unavailable. These packaged pumping stations provide property owners with the opportunity to add buildings to their properties such as studios, granny flats, sheds with amenities. They also allow enormous flexibility to property developers, opening up land areas for development that would previously have been impossible to service. General Pump Company manufactures the Ultraflow packaged pumping stations which can be installed at a low point on a site or in a basement of a building. Sewage, wastewater or stormwater can be drained to the pumping station where it is collected and when the liquid level rises in the pumpwell, the pump/s will start and transfer the liquid out of the pumpwell to the discharge point. Ultraflow pumping stations generally include a reinforced fibreglass pumpwell, 1 – 4 submersible pumps, internal plumbing and valves, an electrical control panel and level switches. There are many optional extras available that can be added to a pumping station – a guide rail system can be fitted to easily and safely install and remove the pump/s from the pumpwell without having to enter the pumpwell or expose yourself to the liquid in the pumpwell. Systems are available that have an intelligent operations capability that allow you to monitor the pump station performance remotely via the internet. This allows for early detection of any potential problems, bringing peace of mind to owners and operators. 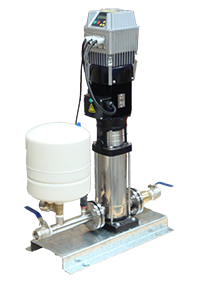 Ultraflow pump stations are supplied with all internal piping and valves installed and ready for use. If guide rail systems are used, they are also mounted in the pump station which mostly eliminates the need for Confined Space Entry. All this makes Ultraflow pump stations quick and simple to install, minimises excavation open times, considerably reducing total installation time, labour costs and associated worksite hazards. Above ground pumping stations are available where excavations are not required or not possible. Ultraflow pumping stations can be installed on the floor of basements & cellars, under elevated houses etc. They are delivered with all pipework, valves and pumps pre-assembled, ready for installation. 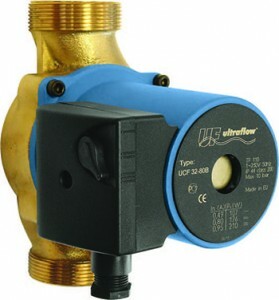 Click to see our list of in-house-branded sewage pumps by Ultraflow.